As I write this I am 46 years old and my wife is 47 years old. We just celebrated our 26th wedding anniversary. We recently celebrated my youngest turning 21 and did the weekend thing in Vegas for her. My oldest very recently turned 23. The kids are a large part of this journey/story as my saving habits have dramatically impacted their lives and also because my oldest is high functioning autistic (meaning she can do most everything for herself, but will likely never have a full time job and the ability to provide for herself). We have lived in the Pacific North West since our high school years. Our only debt is in our mortgages: $63k in our primary house and $107k in our rental. Both are at 3.5% interest, so I have elected not to pay them off thinking I will invest the $170k it would take to pay them off in a better yielding vehicle. That said, I have the cash in the bank and need to get it invested. I am a mid-level engineering manager at a large corporation. My wife hasn’t worked for significant income since our eldest child began having trouble keeping up with the class in the first grade. We quickly decided my wife would home school her in an effort for my daughter to have the best quality of life possible and to balance her education with her learning style (read: she was only willing to learn what interested her at any given time). My annual income is currently ~$180k. My wife is currently getting a modest wage to take care of her ailing mother, though I consider that to be her “mad money” to use for whatever she needs because she has been so good about managing spending for the last 26 years. She made ~$25k last year, but going forward more like $12k. My first job out of college paid $41,400 annually in 1993 and I did environmental engineering work (hazardous and nuclear waste decontamination, repackaging and shipping) which quickly transitioned into operations management work at a large superfund site in Washington State. I did that for three years and the combination of me not wanting to get pigeon-holed as a nuclear guy and that first time our first daughter cried when held by my wife’s mother because she wasn’t around them enough to know/remember them caused me to look for work closer to home (Oregon). That led to my second job as a process engineer at a Southern Oregon medical film manufacturing factory and an increase in pay to ~$60k. After proving myself as a process engineer, the plant manager wanted to “get me into management” and not so subtly “encouraged” me to reconsider my initial refusal of the maintenance supervisor position. After a year of that job and the plant manager not acting quickly enough to get me into a supervisory capacity over process engineers, I moved to NW Oregon where I was given the choice of being a process engineer 5 days a week or an Operations Manager who worked 12 hour days but alternated 3 days one week and 4 days the next. At the time, my kids were young and it was a no-brainer to work the compressed shift. The new salary was ~$70k. I should also include at this point that both job changes were with Fortune 500 companies and the relocation packages (in both cases I opted out of the professional move and cashed out the value) allowed me to save for the down payment on the new house. The first 5 years saw little salary growth (bad economic times and a manager that wanted me to come in and do project work on my days off to further advance), but in 2005 I changed jobs within the company and became a supply chain engineer and started getting promotions and meaningful raises. That year, I got a 10% raise bringing me to $85k base, which I followed up in 2006 with a promotion and a 19% raise bringing me over six figures base pay for the first time in my career. That promotion also put me at the level where my annual bonus also became more meaningful. I was promoted again in 2010 (but it was only 5.4% — my manager at the time wasn’t one to go to bat for you) and a third time in 2014 (12.3%), bringing my base to $145. I haven’t talked about bonuses much, but I also receive ~16% annual bonus and just under 10% (combined) quarterly bonuses as well as ~$24k in RSUs annually. Earlier in my career, my bonuses were not as significant. I didn’t heed this advice my entire career, but be willing to change jobs. When I finally got frustrated enough working as the maintenance supervisor and started looking for work (on then Monster.com in 2000), I recall being amazed out how my value in the market had greatly increased since I had last looked. Work life balance and even the concept of work life balance has changed over time. As a young man, I wanted to be CEO. My father raised me to have a strong work ethic – and I do. I wasn’t afraid to put in the long hours to impress the boss and launch my career. Now, I have more of a “work to live” versus a “live to work” mentality. I look forward to the day when I will have the financial stability to decide if I want to continue my career (though I no longer have aspirations of climbing the corporate ladder), semi-retire doing something I enjoy, or complete FIRE. I will still do what needs to get done, but I am better about building a strong team around me and allowing them to do the heavy lifting. Back when I was an Operation’s Manager getting poor raises (1-3%), I was a bit disgruntled and had the attitude that I could either come in on my days off doing project work to please my boss to perhaps get a 10% raise due to promotion, or I could work for myself and start an online business. Right, wrong, or indifferent, I chose the latter and self-learned how to import goods from China and sell them online. At the time Alibaba was an unknown to me (and most of the USA), but I found the site, established some business contacts in China and imported my first goods which happened to be 100 sets of poker chips (Chris Moneymaker had just won the WSOP and I wanted a nice set of poker chips for myself). I remember the first sales opportunity we had was a local gun show – we had people lined up 10 deep to buy a set of 500 chips for $100 that we paid $40 importing. From there, I learned to (poorly) code a web site, learned to get indexed by Google (much harder to be relevant on the internet than I previously would have guessed), established a wholesale clientele (cold calling), and started importing 20’ ocean containers filled with poker chip sets. I expanded to poker tables and other accessories and eventually grew the business into a six-figure income before the poker bubble broke. Now, this is just a minor residual income stream from selling left-over inventory. When I switched jobs from my 12 hour days as an Operation’s Manager back to a regular 5 day/week job, I lost the free time to stay relevant on the internet (and also was getting burned out by the incredible amount of work – I never hired employees to manage shipping etc.). At one time, I planned to have 3-5 active web sites importing hot, new trendy items from China, riding the popularity and exiting the business as popularity waned. I still think this could be very lucrative, but I’ll offer this advice: do not import something as heavy (expensive and harder to handle) as poker chips (18 pounds for a nicer 500 piece set). About $90k including both mortgages. The main house will be paid off in 3 years and will reduce annual spending to ~$60k, though that will likely be offset by health insurance costs for the gap years between retirement and Medicare. Housing is about $3,000 per month for both houses. The balance is food and living expenses. I no longer keep track of it in a detailed fashion, but we average about $5k per month on our credit card that we use for everything. We currently have no car payments nor credit card debt. The youngest just finished off her associates degree at a local community college (which I paid for out of pocket) and is also living at home to save there. She will be starting at an in-state University in the fall which will double tuition expenses, but I have money saved in a 529 for that purpose. She will still have the opportunity to live at home to save money, though it looks like she may be moving out. I get it (at 21), but I think she should buckle down and grind her last two years so that she can focus on school without needing to work more hours than she already does to offset rent. We don’t currently budget for vacations and are trying to get better about taking them more frequently. When we were younger we had a budget and I also obsessively entered categories of spending into money management software to track. Now, we still manage our monthly spending, but not at the level of detail I used to. Basically, we put everything possible on a reward credit card and pay it off in full every month. Typically it runs around $4k per month, but college tuition, and unexpected expenses cause that to fluctuate occasionally. We are currently saving just shy of 30% of our income. I max out my 401k and employer stock purchase plan, save all of my RSUs (I currently am poorly balanced in my employer’s stock), and receive a matching 401k contribution from my employer annually. I have always been a saver and established my first 401k at the age of 20. While young in my career, I made sure to contribute enough to maximize my employer’s matching contribution and over time increased my contribution with annual raises. Now, I have it maxed out as quickly as I can each year – I have my annual and quarterly bonuses contribute 50% to my 401k. Historically, I have only sold my employers stock once in 18 years. I suffer from paralysis by analysis and tend not to sell unless I have what I consider to be a superior investment opportunity. Most would consider my pinball machine collection a splurge, so I will go with that. Having grown up in high school playing pinball (one of our early dates was playing pinball) and continuing that passion into college, I always wanted a pinball machine. Once I learned that pinball machines actually appreciate, I started picking them up as I could and had room. Once, I purchased another collector’s entire 14 machine collection to get a great price on the lot. I kept the two I really wanted, fixed what needed fixing, and sold the rest one at a time (for a premium from what I paid). At the end of the day, I had two top-tier titles for several thousand under their value. Similar to my employer’s stock, I tend to hang onto pinball machines because I wouldn’t know where to invest the money otherwise. The appreciation from them is better than holding cash, but certainly not as good as I could earn investing it wisely. Like everything else, my investment strategy has evolved over time. Ten years ago I traded quite a lot – I didn’t day trade, but traded every week. I looked for stocks with predictable volatility and bought and sold based on that (buy low, sell high, but on a weekly basis). That was working fine until I guessed wrong on a stock I held for over a year (because I hate taking a loss). Since then, like a lot of the other folks interviewed, I primarily use index funds for the bulk of my investments. I have always been fairly risky and tend to invest in aggressive funds. As I approach retirement, I recognize that I should balance my portfolio, but have not. I purchased it on a short sale in 2013 and was very aggressive in the negotiation. It has increased in value by a factor of 2.2 in 5 years. To contrast, I bought my main house in 2000 and it has increased in value by a factor of 2.57 in 18 years. This one is easy. About a year before the show Gold Rush premiered, a very good colleague left the company I still work for to start a consulting company. The Canadian gold mining company he was consulting for liked him so well they hired him to be Vice President of Operations. He approached me with assay results supporting the possibility to make millions off of a $25k investment. I knew with him at the helm, my investment was safe, so I doubled down and invested $50k (this was at the peak of my poker business sales and I had the cash). My attitude at the time was that I would either retire a young man, or end up needing to work another year because of the gamble. What didn’t occur to me was that my VP of Operations was not an owner and could be fired….which happened when he started to uncover careless spending, poor operations fundamentals and otherwise started to “rock the boat”. My $50k went to zero within 1 year. Overall is tougher to calculate, but since 2012 I have been keeping track with a spreadsheet and combined returns (reinvesting dividends) looks like 11%. For what it’s worth, the pinball collection is only 4.5%, though that does not take into account the value associated with a very good buy (i.e. the collection I bought, or buying below fair market value), but also does not include the man hours of maintenance I have done. If I had to guess, overall return since I started my career in 1993 is likely in the 8% range, though I guess I am not factoring in the gold mine bust. I review at least annually, but seldom touch as it has been performing well since 2012. As I mentioned before, I have always been a saver. When I was a kid and getting a $5 per week allowance, it was typical for me to have >$100 saved at any given time. That carried through into adulthood and morphed into being very conservative with my spending. When my wife and I met, she did not have great spending habits, but as we became engaged and later married she got on board and was quite a quick study. Now it is second nature for her. The bulk of my wealth was made through my salary and saving/investing. We seldom took vacations and tended to live frugally. Instead of going to the movies frequently, we instead purchased a nice flat screen television and sound system for our house. I am good with my hands so tend to do most household repair work myself (though I find as I age I am no longer as eager). When my poker business was more active, I bartered a lot for services I couldn’t or didn’t want to do. I was fortunate to be a good enough student to get an engineering degree. I’d say that was the biggest factor in building my wealth. I think hands down it is Earn. Save would be a close second. I’ve always thought if I studied it more closely I could be a good investor, but somehow haven’t found the time. Perhaps in retirement…. We already discussed investing in the gold mine. I guess the best way to describe how I handled it was to take it as a learning experience. Of course the major stock market crash of 2008 and subsequent housing adjustment impacted us. Through my lazy investing habits, I had around $100k in cash at the time and took advantage of the opportunity to get that back in the market. For the housing crisis the PNW was hit, but has since recovered – so we rode that one out. My most recent road bump was leveraging my China connections to import a new swim spa for the house. I saved ~$10k in the process, but the finish quality was poor, so the UV destroyed it in 2-3 years and I had to paint it. The control packs (USA made) both failed, and I have recently decided after 6 years that I should demo it, redo the deck, and put a new Costco bought spa in its place. Our first house (starter by any definition) lost value after 3 years, so I put a renter in it until I was able to break even and sell it. Life has dealt us many non-financial road blocks, but I will reserve those for another blog…. I continue to purchase my employers SPP, max out my retirement savings vehicles etc., but I am less active at growing my net worth looking at the side hustle perspective. I have a target liquid net worth (meaning not counting my primary residence) of $2M. That’s based on needing to provide a perpetual income stream for my autistic daughter and my current spending habits. I plan to withdraw $80k per year forever and set up generational wealth, particularly if my investments can outperform the conservative 4% return I am assuming. Per my financial management software, I was 42 (March 2014) when I first became a millionaire. We have not made any behavioral shifts intentionally, though as I referenced, we are less disciplined in our 40s than in our 30s for sure. I consider it a mistake not spending $3 – $6k annually on vacation/travel once I could afford to do so. I think I will always struggle spending despite this. This is a good time to introduce the concept of regret. Not that I would ever get caught up in “keeping up with the Joneses”, but to some degree I was dragged into it, particularly with my youngest. Parents need to be prepared to deal with tough situations here. “Susie’s parents just bought her an Iphone X”, “why does Timmy go to Hawaii every year and we can’t”. My observation is that this issue is more prevalent in dual income high earning families and also with families that have gone through divorce. Always remember that you only get 18 summer breaks with your kids and will never get the opportunity for a “do over” – it can be a tough balance to strike. I sometimes question whether I struck the right balance of saving/spending while my kids were younger and plan to make it up with grandkids some day. This topic is probably the number one reason I volunteered for this interview. I want young readers of this column to realize now that quality time with family needs to be factored into your budget. Force date night and vacations with the kids, occasionally splurge and go to the Super Bowl the year your team finally makes it, etc. The key here is to budget for it and to not feel “bad” for the expense. Start young and max any employer 401k match. Establish a budget and stick to it – live within your means while gradually increasing your 401k contribution until you max it out. For younger investors, Roth is a no brainer (for me I have not been able to decide on a conversion). If you never miss the money in your paycheck, you will not feel deprived from a former standard of living – so a typical strategy is to bump your 401k contribution by half of your annual raise. That way you feel an impact from the raise, but also advance your FIRE goal. Evaluate the real estate market once you can afford a down payment (negotiate this in your job offer – a hiring bonus, or a lump sum relocation package). For me buy versus rent was always simple – we wanted to own our house, but it is not always the best decision in any given real estate market. Don’t worry about what everyone else is doing. Resist the urge to always drive a new car (we currently drive a 2005 and a 2013) or buy a new house (we have lived in our house for 18 years and are admittedly ready to move) – in general “keeping up with the Joneses” is a real thing and, in my opinion, should be avoided. My view of most material things is function, not flash (automobiles is a good example – to me they are transportation). My immediate focus is retiring early. My target date is 2023, but that requires a 7.2% rate of return to achieve. As long as the economy does not get crippled (in any number of ways possible) in the next 5 years, I am on track. As far as working beyond that, I have not planned that in detail. I expect we may become more involved in volunteering (in Special Olympics which my oldest is involved in, for example). My wife has always talked about starting work when I retire for medical benefits, but it makes more sense for me to work one extra year, if needs be. We both will need to find other social outlets for sure though. Financially my goal has always been to not to have to worry about money in retirement. That got adjusted when we learned our oldest had special needs, so my new goal is to have $2M liquid that I can draw interest/dividend income from. Ideally, the $2M will grow and allow for a perpetual inheritance. Activities-wise, I used my last 8 week sabbatical to test drive having no plans and things were fine. We will likely get involved in clubs and activities and travel as well. The three primary issues that concern me are medical coverage, the financial stability of the rest of my family, and fairly providing for my children. Many on here have talked to the medical coverage topic and I think that is now well understood. I am basically planning for $25k-$30k annually from retirement to Medicare. The financial stability of the rest of the family is a difficult subject to tackle. Basically my wife and I are the most financially successful members of our families – meaning we have brothers, sisters, aunts, uncles, cousins, and parents that are not prepared for retirement. At times I feel like it is my duty to continue to work to help them. At other times I recognize that it is not my job to provide for them financially. I know it will be difficult to watch our loved ones struggle in the future, so don’t have the answer here – feel free to offer input. For most, fairly providing for your children is an easy one, but for me I struggle with what is fair. 50/50 feels fair, but I have one special needs daughter and one daughter without special needs (my youngest). Is it fair to provide more for my special needs daughter? This is a re-entrant topic in my life as we have also dealt with it from a time perspective – my youngest daughter’s observation is that my special needs daughter gets more time and attention (particularly from Mom). It’s a tough topic and I will readily admit I don’t have the answers. As our youngest has aged, I know that she “gets it”, but to her it still does not feel “fair”. To her credit, she is wonderful with her sister and generally has a personality that people are drawn to. It makes me sad that she sometimes feels overlooked, but to some degree I think it is human nature. I have always been good with money as mentioned earlier. My father was not particularly good with money (sometimes buying impulsively), though he was a successful businessman and professor. As a result, my Mom has always been very thrifty causing me to think I learned a lot of my habits from her, but for the most part, I am just wired that way. As an engineer, I took micro and macroeconomics, but by then most of my financial practices were set. I have always been a strong negotiator buying cars and houses, but I the only formal training has been later in my career. Hero is a strong word for me. The closest thing I have to a hero is my father. The single biggest thing he did to heavily influence my financial life is when he course-corrected my college major from business (because he was successful with an MBA) to engineering. He correctly observed that in high school I was good at math and chemistry and suggested I try engineering school first and fall back on a business degree. If necessary. It wasn’t. I think I could have been successful in any major I chose, but there is no question that an engineering degree was (still is) heavily recruited at high starting salaries, which makes the SI in ESI much easier. Consistent with my above answer, I think I was wired to excel. It never crossed my mind as a child that going to college was a choice. Not because my parents drilled that mantra into me, it’s just how I have always thought. We donate goods to charity, but do not attend a religious service regularly to tithe. As mentioned above, we have immediate family members in various degrees of financial dysfunction that we help on an as-needed basis. Again, a tricky topic because we don’t want to become known as the go-to team when times are rough, but we also don’t want to be perceived (or to be in reality) the “rich relatives that don’t care about anyone but themselves”. I hope I have adequately covered this topic in previous questions, but I realize my responses are long and I will provide a quick summary here. Our plan is to save $2M liquid and to draw from it perpetually at 4%. This is largely due to my adult special needs daughter, but also because it is reachable for me and feels like the responsible thing to do. It took me until my 40s to realize that I may not have been born with a silver spoon in my mouth, but I also was not born with the deck stacked against me. I want to leave something for future generations to appreciate and hopefully add to. I am not interested in future generations having “family money”, but I am hopeful that I will leave a resource that responsible future generations will effectively manage and grow. An interesting read, in particular your struggle with the concept of “fair.” What is fair today for one child, may be unfair for another but can change rapidly. I personally believe fairness is predicted by situational needs. Having had two sons everyday was a challenge to be what was then fair. Things changed after they matured. You appear to have a plan which is working for you, keep to it. It really has been a perception issue with my younger daughter. Fair in the sense of “attention” from Mom and Dad…. it’s tough to explain the guilt if you have never dealt with a special needs situation. Thanks for the comment. Grounded in reality —— thanks for sharing the information about needy relatives. I struggle with this area as well. Regrets: I have many, but I deal with not spending enough time with my family in the early years. As you clearly stated, you only have 18 summer breaks and you’ll never get them back again. I’m with you, sure hope the young guns are listening to you here —— time seems to fly by so quickly, so, don’t blink. My boys are in their 30’s now and life is hitting them hard now (Cats in the Cradle stuff) —- sadly, I’m missing all those early days when they were young. But, I am enjoying watching them build their careers and their families. My wife and I will be fine and are both in our early 60’s, and will retire in 2020 ——- life is good and trust me, our 2 grandkids (1 coming in early March) are benefiting greatly now. Focused on learning the art of being grandparents has been a blast. Enough —— you, my friend, have done well and I love the way to dedicate yourself to your family, measured key metrics and the future. Keep it up and good luck ? I’m glad you agree – that’s exactly why I called it out. FIRE and proper work life balance do not exactly jibe. I think it is important for younger readers to consider the balance – perhaps that is why the trend in young adults is to wait until the 30’s to marry and start a family (I married at 20 and had our first child at 23). Knowing the value of compounding interest and the importance of those early years made it very tough for me to splurge – I think that was a mistake that I’d like to see others avoid. I tell myself I will make up for it in my kids adult years, but life happens – no one can predict when a major unexpected life turn will happen. Congrats on a 2020 retirement. It is too soon for me to predict a date. My goal is to get to where I can retire and then go year by year. I dream of working a few extra years to help those who are needy in the family, but it is getting to be such a grind…. I’m hoping to hold of being a grandpa for several more years (I could live with my kids waiting until their 30’s). I will offer my skillset in setting up live streaming equipment to play machines from the pinball collection and share that via Twitch! 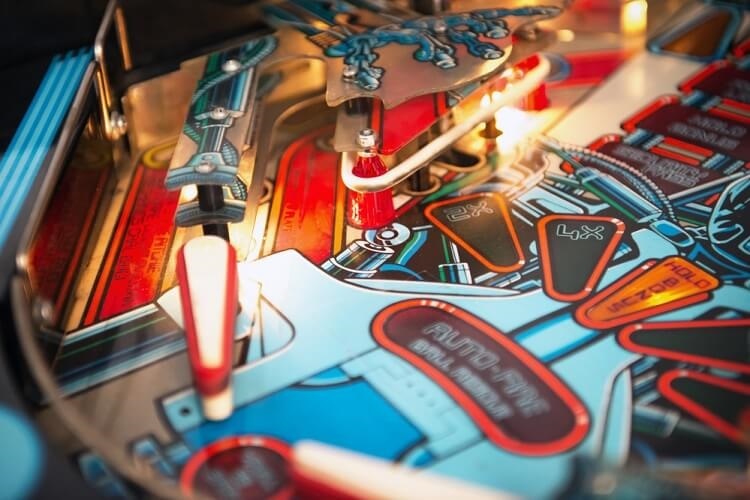 There’s a rapidly growing community of pinball players, and the engagement is so fun. Those machines deserve to be played, and people out there want to watch. This is great. I had a similar experience, though I hit it at 38! (Yep, I remember the exact day.) Such an important realization. I’ve found it made me thankful for what I’ve accomplished and eager to give back. Thanks for sharing your story, lots of good information and inspiration here. I honestly used to think that any human could get straight A’s if they put their mind to it. I remember the day I was looking at my youngest’s drawings for her art project (she is very talented) and I finally realized that there was no amount of practice, lessons, studying I could do to duplicate the talent she has….from there I had a light bulb moment where I realized others struggle with math/science as I do with artistic endeavors. It definitely makes me more appreciative of what I do have and sympathetic for those that aren’t wired like me (not saying I am better off, just wired for professions that pull $$ like engineering). Thanks for commenting and good luck on your journey. Great story. Very impressive that you achieved your NW number on essentially a single income. You should be proud of that achievement, and your kids are better for it having their mom spending more time with them. We are at a similar level, but it required two incomes to get there – good for you! I see see lots of parallels in our our journeys – I am a fellow engineer and entered job market in ’94. Good luck! Thanks. The kids LOVE their Mom. I feel fortunate we were able to swing that as well (despite not being the original plan). I do take pride in the fact that we have been essentially one income, but am secretly jealous of my colleagues who are dual high paying incomes. I also work with a lot of folks I know could retire if they wanted to and don’t understand why they don’t. Different strokes for different folks I guess. Good luck on your journey as well. Do you have a number? $3.2M – that’s our target! Click on the MI-94 link for all the details on how i came up with this, again, looks like we have a similar approach. It must be the engineering economics coming out. Will do – I have lost track of who’s who that I have read already. I kind of binge read and they blur together. Just read your interview (I hadn’t yet). Very similar with the exception of the single versus dual income. 2013 was a big year for you – was that a promotion year popping your income 50k? I too am worried that this generation will not be motivated to do actual work and many will have to try and fail at being youtube personalities or twitch streamers – hopefully that will be a quick and easy lesson. So here is a recap my math on the $3.2M. My target is to have $100k per year of income in retirement after taxes. Apply the 4% rule (meaning I can withdraw 4% per year out of our investment pile every year and not deplete it) and assuming a 15% tax rate on long term capital gains I need $2.9M to kick off $117k per year, which after 15% taxes are deducted should provide us $100k per year. I am conservatively assuming I will need $350k to put two kids through college, so I then add this amount to the total pile required number. Hopefully we find a cheaper college alternative (or maybe even no college) I but I like to plan for the worst. Adding the kids’ college expenses in, I need an investment pile of $3.2M. This doesn’t include any later in life life expenses, increases in healthcare costs, long-term disability and other unplanned expensive events. I’m assuming that inflation, a few bad years in he market, will eventually consume the entire pile leaving little behind for what I sincerely hope are by then my successful financially independent adult kids. If there is some left behind I can always increase my spending which because I’m cheap will be really hard to do. Or there may be a little bit left for the kids. if I have a large amount left behind, that means my conservative approach worked. The 4% math doesn’t really factor and inflation in the fact that we will likely need more than 100 K per year in future years. I’m assuming this will be made up by the greater than 4% growth in the investment pile, but there is a chance this doesn’t work or inflation outpaces investment pile growth forcing larger withdrawals and later depletion of the pile. Regarding Quicken… been on it since 1994. Yes the subscription model was a change. However I was paying for the new software every few years so the subscription really is not that big a difference in total out of pocket expenses from my perspective. I like the product enough that I feel like I am getting a fair value for the subscription. I recently had a problem and needed to use their tech-support. I was pleasantly surprised that the phone support was very good and they resolved some online balance update issues I was having. Netflix, Apple Music, Amazon prime, Hulu TV, cell phone, I feel like we have become somewhat used of the subscription model. It is less annoying to me that I used to be. It would be interesting to see how our offline excel back ups compare. I do essentially a balance summary of all accounts every few months which total up to a net worth number. This goes back to 2005. I use that data to calculate average growth rate per year and then forecast out when I am likely to hit my magic number of 3.2 based on best and worst years. Enjoyed the interview. With your income and situation with your daughter, I’d agree that its probably good to keep working a while longer to build up some extra savings/ investments. Kind of like an insurance policy. Your mention of “regret” is important to keep in mind also. Sometimes you can get too caught up in the whole FIRE/ frugal mindset that you can take it too far. Scrimp on everything for 10 or 20 years for the “goal” but miss out on a few things you probably should have done more of along the way. It can be tricky, but sometimes you gotta push yourself to do it. Agreed. In Munich today (I need to get to bed – up 29 hours travelling) and the FIRST time my wife has gone with me – first time for her outside of US/Canada. I hope we can keep it up! A truly wonderful interview and advice. I remember when our oldest daughter left for university in the fall, and I realized, all you get is those 18 years….. But she is in second year now, and growing up to be an incredible young woman, and we are so proud of her….. so as parents we did our job well, but still regret we did not do more big trips with the kids when they were little. I totally agree about vehicles too, they are just transportation. I have a loose plan to make up for it with future grand kids and families….hoping my kids appreciate it and remember the experiences better as adults and future grand kids will know me differently than my kids do. As an FYI, I happen to be in Europe this week for business travel, so bear with me on the time delta. Also, particularly for those junior to me, feel free to ask probing questions, I’m game. We are of similar age and income, and you have double my net worth. I’d say you’ve done just fine. Congrats to you! We have one special needs daughter and one neurotypical son. I explained to my son that my “fair” is based on need and it may or may not be “equal”. My daughter gets much more attention because she needs it (life skills learning, one-on-one engagement for learning interpersonal skills, etc.). My son got all of my daughter’s 529 funds since she very likely won’t have the capability to go to college. At some point, our daughter will get a different allocation of our assets in her special needs trust and our son will need to understand that her needs (and inability to earn) drives us to provide for her differently. I don’ t lose sleep over this decision. Our stuff, our rules. Sounds very familiar Philip, and I agree 100%. I think with time my youngest will fully understand and I suspect she does now, though she has trouble with “fair” relative to her peer’s upbringing. Parenting can be very hard. Hi Josh – I bought the rental in 2013 for a family member to live in who has been a renter for 20 years. I figured I may as well earn appreciation if they weren’t going to buy themselves. I had them find the house and I handled the negotiation. It was a short sale and that made it both the best opportunity and worst at the same time… It took over a year to close, but I was able to get it for a very good price (has more than doubled in 5 years). As far as more rentals, I have always liked the idea and actively beat around the idea of buying an apartment complex with a friend. That said, I suspect I won’t because of the potential for problems. I’m getting to the age where I no longer appreciate doing all of the maintenance myself and also value my time more highly. Paying someone else to do the maintenance eats into the profit. We’ll see. Good point in retirement – perhaps that is the right time. I don’t know about helping out relatives. Over the years, I’ved gifted out over 1.5 million dollars to extended family. But honestly none of them remember or perhaps are even aware of how much I gave. Could just be my family, but I never thought of my family as clueless before. I pulled back a lot on the giving after I figured out that it was fueling new car purchases (I drive a 14 year old car), early retirement for them, and legacy wealth, and especially after my brother-in-law remarked that I didn’t fight for the bill when we ate out during a family trip (I gifted his kids about 350k in stock, footed their portion of the 150k in bills for a rental property, treated their whole family to a cruise vacation years ago, let their family keep all the rental income from a jointly owned rental property for 20 years when they were raising a family, etc etc). Just don’t bother, they might resent you either way. It’s a weird feeling sacrificing for family when finally you realize they don’t even know what you did for them. I’m sorry to hear that Joe and thank you for the advice. Some members of my extended family live near the poverty level and I would like to help them live a bit more comfortably. This is another area where my FIRE drive makes me feel a built guilty. Unfortunately, we’ve found that those relationships do not last. I once read an article about a lottery winner (the typical wins millions ends up broke thing). The thing that struck me was that he was so hurt by all the friends and family he had given handouts to… he was shocked at the level of anger and hostility he received the moment he tried to cut off the gravy train. It is sad that achieving the dream comes with this type of crap, but its something we’ve had to learn how to deal wit, and it represents a significant loss, that our wealth means that certain of our friends and family cannot handle their envy, jealousy, or sense of entitlement, and those relationships cannot endure. Good interview and excellent reminder to balance current life enjoyment with future retirement enjoyments. It has been difficult for us to shift from being savers to being in retirement and spending money. A good problem to have but the mind set shift is a change. Family gifting can be challenging too. I notice extended family have no issues on spending money vs planning for future. Different retirement strategy than I have/had, so I am using their spending habits to loosen my pockets and enjoy life more. Why scrimp my retirement so they inherit more? CB – good point that couples with Joe’s input above. You touched a soft spot. Most of the family that struggles also does not live nearly as thrifty as I do. No issues buying a carton of smokes and equally no issues putting there hand out asking for money. It makes it very difficult (or read easier to take a holier than thou attitude). I think I will struggle with spending more, but plan on implementing a looser budget to help drive spending. We tried to keep as low a profile as possible for many years, so as not to appear too flush – we’d be the ones driving a 15 year old beater when others were pulling up in shiny new luxury cars. But you will reach a certain threshold where you can’t hide the fact that you’ve “hit the life lottery”. I get it on some level – in my work and among my friends and neighbors I associate with some very wealthy people, and human nature is human nature… there will always be someone with more money and better looks. If you’re a competitive person, as I am, it takes emotional maturity to handle that and focus on your own blessings. Usually with the folks who have a problem with others’ wealth, emotional maturity is exactly what they are lacking and the very reason they are coming up short. Certainly, when you FIRE it will become abundantly apparent that you are different from the rest of your family. It never occurs to these folks that its their own habits and decisions holding them back. And there is no way to explain that to them without coming across as condescending. Wish I had some good advice, other than to carefully manage what you say and do around them, and even that does not always save those relationships. It’s funny, this is a common theme. I also have less successful family members that, not only don’t appreciate charity provided to them over the years, but actually resent us as a result providing it. I think its a weird shame/jealousy dynamic. I touch on this in my interview #94 briefly. My advice is just don’t loan or gift money to friends and family. Provide advice, suggestions and guidance on how to handle money all day long if it is asked for but don’t give money or loans. It typically doesn’t help them at all (after all they were not successfully handing their own money which they actually worked for – why would they handle money given to them for free by you any better?) and in the ends hurts the relationship, sometimes permanently. I have a few folks that I would like to be much closer with but I am not, which I attribute directly to well intended loans/gifts that later created friction. We never advertised our success, but now that the gap is even greater than ever, I really go out of my way to make sure we lay low and keep the net worth numbers invisible to all around us. Easy to do as we live the millionaire next door lifestyle. The cars we drive are junk compared to the ones driven by relatives that live pay check to pay check, have had a few bankruptcies behind them and are in perpetual financial turmoil. Funny how that works! As someone mentioned above, they attribute their fortunes vs ours to luck and external factors rather than decisions, choices, hard work and sacrifice. The fact that I can’t talk about money with most of the family is actually a reason why I did this interview here – it was an outlet to talk about what we have done with ourselves. Talking about this to family would just create resentment, or requests for assistance. The interview was a nice way to share the experience and discuss with other like minded folks that had done the same thing, or are interested in trying to get there. 1) Stall… let the drama die down. Resist the temptation to fix-it. Wife and I are naturally rabid problem solvers, so this is tough for us but it works. Often what seems like an insurmountable problem requiring immediate cash infusion becomes much clearer in the light of day. 2) Ask lots of probing questions… if you’re asking me for money you gotta open your books. The last thing most people want is to have you, Mr/Ms Smarty Pants all up in their business and seeing how badly they messed up. 4) Make it extremely abundantly clear that they only get ONE request… EVER and that its up to them to decide if this is the crisis they would like to blow that one genie wish on…. “whaa you mean this is it… i never get to ask you for money ever again… hmmm… maybe this is not what i want to blow my one wish on…” (fyi, people never really honor this promise but its worth a try). If after all that, if the crisis still exists, and they are still at your door, then maybe its a worthy crisis and you are their last resort. If it’s someone I want to continue having a relationship with, then I will expect and pursue repayment, especially once I see them taking nice vacations and driving nice cars (with my money). If I never want to see them again, then will let it go… the unpaid debt is usually enough to kill the relationship, especially when that second request is denied. As noted previously, keeping a low profile works up to a point. But somewhere along the way, they know you’ve got it. And they will come a knockin. Interesting, I like this approach. I guess with great power (or money) comes great responsibility. It is discouraging to see the actions of family / friends when they perceive you have money. I do feel that since we’re very blessed we have an obligation to pay if forward, I just hate when others expect it to be for them. I remember during a tough moment with extended family, I felt like my grandfather was being taken advantage of financially. He wasn’t rich, but better off than his siblings and was therefore contributing more. His statement was “if they can live with it then I can live without it”. I’ll never forget this and it drives me to humbly remember others’ struggles, it just gets hard when people continue to stick their hands out while they may be splurging more than me. The other annoying trait is when people consistently say: “Come on, let’s go (party / out to eat / vacation / etc)! You and your wife make a lot of money and you can afford it! Stop being cheap / stingy!”. I quickly distance myself from those that do this. Sure, it’s ok to joke once or twice but when I perceive that’s your general mindset towards me, we become acquaintances and I no longer trust you. What I do with my money isn’t your decision. I recently caught some attention and negative comments by purchasing a BMW, and I knew it would probably happen by those same “friends” mentioned above. My general response is “I just wanted a toy” and sometimes they leave it at that. If they keep saying it then I typically just reply by pointing out that they paid more for their car than I did for mine. I bought a used car that had been taken care of with low miles and got a fantastic deal whereas others bought a new car and were taken advantage of. Sure, I may spend more in maintenance / keeping it on the road, but I enjoy it. They typically get become more flustered once they realize they paid more for a Toyota than I paid for a luxury car. It’s just sad we even have these conversations as everyone is free to spend their money how they choose. Opps, correction… its a “4-Step” process. And bottom-line, the reason it works so well is because you make it clear that you are NOT going to be the quickest, easiest, least intrusive, least costly, least embarrassing option. What’s the alternative? A: creating a dependency that you will only be resented for further down the road. So, really, harsh as it seems, there is little real choice. There are legit emergencies from time to time – but you have to have a way of sorting through all the clutter and making sure people have exhausted all their other options first so that you are not the default first option. Great comments and suggestions from all. I appreciate the fact that a good dialogue got going on this topic. Generally speaking, one cannot hide the fact that they work as an engineer and have a degree in engineering. Any cursory glass door search on this would put people in the ballpark of what my salary could be. Investment income, rental, etc is not as available. I, too, drive older cars (2005 and 2013) and live in a more modest house than I can afford, but I remember the day that there was family “buzz” when someone Zillowed (that’s a verb) my address and pointed out to all what we paid for it (affordable housing is not readily available here). I’d like to think that it is obvious to everyone that I live well below my means and make life choices that they choose not to, but I resent the fact that some likely perceive me to be “greedy” with my money. A Saver and accumulater all my life and I fear that I may have a much harder time living as a consumer——. But, I’m going to try to build this new skill set as well. My wife keeps telling me that she’s going to mentor and teach me well in this important area. And I know the importance of listening to her. Mav – had a couple at the Christmas Market for ya. The health care piece is such a wildcard – I take several high dollar prescription meds for various things.. so in my case $1500 a month gets us in the door, but that is catastrophic coverage from what I see – can basically double that if anything serious is going on. Glad things worked out for you! Great interview! I am also an engineer for a large corporation and I really enjoyed reading this. I can relate with the family giving – there really isn’t a right answer. I think Miguel above offers some great advice, but people can be nasty and I believe will still perceive you as rich, uncaring, and out of touch with reality. It’s also a shame that stealth wealth is forced out of fear. It should be something people practice because they want to, not due to the expectation of family handouts. –This is a great comment! I recently gave in to my wife to take a vacation to Europe next year. It’s going to be expensive, but as my boss said: “you can’t take it with you!”. We have done fairly well in the early stages of our careers so we decided to make the splurge and enjoy time together while we’re still young and DINK. We hope to have kids ASAP and it will impact our ability to do things like this. Best of luck in finding balance for your children. Do what you feel is right and I believe your youngest will respect you for it as she ages (regardless of the currently-perceived lack of fairness). “Stealth wealth” that’s a good one. I plan on using that in the future. I am certainly in stealth mode. Because you want to be or because you feel you need to be? By choice I am a big practitioner of millionaire next door approach. Basic house, older used cars, nothing too flashy, no accouterments of wealth. If we don’t need it we really don’t want it. I think being humble rather than flashy is a virtue. I like to keep things simple. Although the behind the scenes net worth number is something to be proud of, there a few relatives out there that if they saw the size of the net-worth pie that they might want make a request to be donated an unearned slice. Better they don’t know what we have so they are not tempted to ask. If they truly needed of course we would help, but their problems lie in spending all their money and then just a bit more on “wants” rather than “needs”. Love the interview and all the comments regarding family. While I am still working on accumulating wealth and am far off form my FI number this is something that have been considering for a while. My family is much like the ones above where it is anticipated that everyone helps and since I am the most successful one I will face similar issues as they grow old. Still not sure how I will update my FI number to include family outlays or how to say no.